Updates for our core after school program. All year long, our students have been learning about filmmaking, stop-motion animation and social awareness issues like domestic violence and recycling. The hard work of over 30 students has culminated in a lot of really entertaining short films. On June 6, at 5 pm, at the Bayside Community Center, they get to show off all of that hard work. Everyone is invited to this community potluck. There is no charge for the event, so bring a side dish to share. We will supply a main entree, some fantastic speakers, lots of entertainment and an opportunity drawing full of goodies from the area. Create community with us and have a great time doing it. If you’d like to help us out with this event, future events or by sponsoring a youth during next year’s programming, please contact us. Fall is here in San Diego and our idyllic temperatures have given way to chilly evenings. As the climate changes, our sunsets seem to be soaking up all the perfection that our days use to hold. That is fortunate for our Summer continuing education documentary crew as they held their final shoot at Sunset Cliffs with one of the greatest sunsets any of us had ever seen. They are making a survivor story documentary. While there, their subject confided in them, that until she began being abused, she used to watch the sunset every night. This was the first sunset she had seen since her abuse began. It was a powerful moment for all of us. As the year flies by, our program grows stronger. Our first classroom at Montgomery Middle School in Linda Vista has put together an incredible script and are now constructing the visuals. The girls in the program are growing in confidence and comradery with each other. While set backs with the school district and the board of education continue to plague us, we see the end in sight to begin two more classes in January. We believe that our perseverance through these road blocks have made us stronger and better prepared as an organization. We believe… in the power of our students, in the hope inherent in our communities, in the end of violence in relationships and a future where our youth can love with respect. This holiday season, we are beginning the ‘I believe’ campaign. 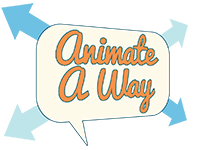 With our sponsors and partners we are expanding our presence in the community and officially unveiling our organization as Animate A Way, after working as Girls! Camera! Action! Our social media presence and new website are in place and we are excited. December 3rd is our official launch, with a great community event organized at the Bayside Community Center in Linda Vista from 5:30 – 7:30 pm. Everyone is welcome to attend this mixer, to hear from local politicians working towards an end to violence, to hear from us and our students and to enjoy some snacks and refreshments provided by our wonderful sponsors Nothing Bundt Cakes and Pappalecco’s. Join us in creating change. There is always a way.